Storm Team4 predicts this weekend will give the D.C. area a taste of spring-like weather, with highs from the mid 50s all the way up to the mid 60s. Granted, it's sandwiched between last Monday's snow and the possibility of rain early next week... but that just means you need to enjoy it while you can! NBC Washington has the guide to get you out of the house. Take a tour: See Georgetown's true haunts, learn about the night of President Lincoln's assassination or choose from a variety of other events via Free Tours by Foot. You should book the tours in advance through their website. Every tour is pay-as-you wish. 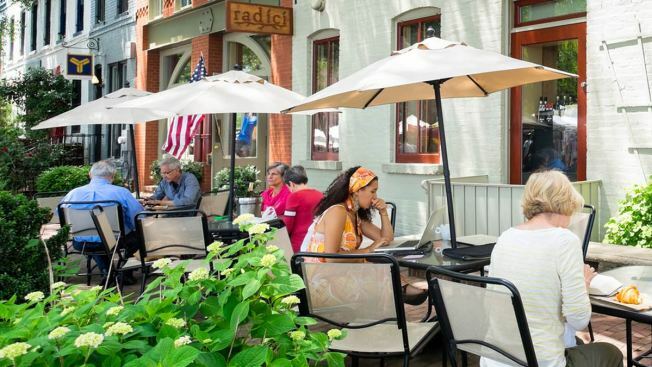 Eat (or drink) something outside: We're pretty sure that dozens of local restaurants and bars will be opening up their patios, courtyards and rooftop decks for this weekend's warm weather -- and we're equally sure that they'll be letting everyone know via social media. Check out @DCscene's restaurants and bars list for up-to-the-moment updates from more than 160 local spots. Visit Bei Bei: Get a peek at D.C.'s very own panda cub this weekend at the National Zoo (3001 Connecticut Ave. NW). Enjoy daily events including the Elephant Training Demonstration at the Elephant Outpost at 11 a.m. On Saturday, attend the Keeper's Choice Demonstration at 1:30 p.m., where staff will introduce visitors to one of the species on the American Trail. Ride the Capital Wheel: Visit National Harbor and ride the Capital Wheel (116 Waterfront St., National Harbor, Maryland) to rise 180 feet over the Potomac River, catching views of the White House, National Mall and other D.C. sites. The wheel runs until 10 p.m. General admission tickets are $15; get them online here. Stroll the National Arboretum: If you really want to be outside to enjoy the springy weather, go to the National Arboretum (3501 New York Ave. NE) and walk through the gardens or the woods for free until 5 p.m. each day. The arboretum has plenty of winter-blooming plants and more than 100 types of evergreens, as well as fragrant wintersweet shrubs in the Asian Collection, and hollies in the Holly Magnolia Collection. Explore the Yards Park: One of the District's most impressive newer spots, the Yards Park (355 Water St. SE) is part park, part art installation. Dip your toes in a fountain that's more like a shallow pool, grab a snack from Ice Cream Jubilee or settle in for a meal at waterfront spots Aqua 301 or Osteria Morini. What's more, a two-week light art display launches at the park this weekend. Hit the trail: Explore Roosevelt Island, Great Falls or Rock Creek Park for some local walking or hiking. If you're up for a road trip, consider Shenandoah National Park, about three hours from D.C., which has a variety of trails from easy to strenuous. Our pick: White Oak Canyon and Cedar Run, which offer stunning waterfall views, and might be a little less crowded than the wildly popular Old Rag. Dust off your sad, ignored bike: Head out to explore one of D.C.'s many bike trails (see maps here), take loops around Hains Point or the National Mall, or join in a group ride like the ones that depart from the Bike Rack. Don't have your own bike? It's OK -- rent one from one of Capital Bikeshare's many stations throughout the area. Or has it been awhile since you've ridden? Consider the Washington Area Biking Association's adult education classes. Go ziplining or take a ropes course: Find outdoor thrills high in the trees. Terrapin Adventures (8600 Foundry Street, Savage, Maryland) offers ropes courses, ziplines and giant swings, as well as caving, biking, geocaching and more. Take a free fitness class:RSVP for your chance at free fitness classes from local studios through Yelp Fit Club. This Saturday, Spark Yoga in Arlington is offering aerial yoga; and Zengo Cycle in Kentlands is offering an intense but fun cycling class. Frederick Douglass National Historic Site (1411 W St. SE): Visitors can explore the grounds for a great view of D.C. and catch a tour of the famous abolitionist's home at several set times through the day. The tours are free, but reservations are recommended. The site is open between 9 a.m. and 4:30 p.m. daily. The Renwick Gallery (1661 Pennsylvania Ave. NW): The recently renovated gallery usually has a line on weekends that allows you to stand outside for at least 10 minutes and catch a glimpse of the White House -- and in this weather, you probably won't mind being outside. If you haven't seen the Wonder Exhibit yet, do not miss it before it ends later this year. Eastern Market (225 7th St. SE): This Capitol Hill mainstay is part farmers' market, part bazaar and part flea market. It's open Saturdays and Sundays starting at 7 a.m. Expect big crowds and make sure to sample produce and cheese. When you're done, make a stop at the packed-to-the-gills Capitol Hill Books (657 C St. SE), which offers thousands of used books (and plenty of wonderfully snarky signage from the owner). Torpedo Factory Art Center (105 N. Union St., Alexandria): The Torpedo Factory's mission is to connect artists with the public, and their open space allows that. Artists work in the factory and the public can visit the building from 10 a.m. to 6 p.m. most days. Remember, each artist keeps their own studio hours. Black History Month Instameet and Tour: Instagram teamed up with the Congressional Black Caucus and Congressional Black Caucus Foundation to find some of the most interesting and beautiful spots in D.C., including the Martin Luther King Jr. Memorial, Howard Theater, Blagden Alley and Ben's Chili Bowl. Meet for a walking tour in front of the Lincoln Theater (1215 U St. NW) at 1 p.m. Sunday. The Travel & Adventure Show at the Washington Convention Center (801 Mt. Vernon Place NW): Get new travel inspirations to cure your wanderlust. Speak directly with travel experts to plan your next trip and maybe score money-saving deals. The two-day convention runs Saturday 10 a.m. to 5 p.m. and Sunday 11 a.m. to 4 p.m. One-day tickets are $16; two-day tickets are $25. Children 16 and under get in free with a paid adult. Chinese New Year at the Leesburg Corner Premium Outlets (241 Fort Evans Road NE, Leesburg, Virginia): Celebrate the Year of the Monkey with children's crafts, food samplings and martial arts demonstrations Saturday from 1 p.m. to 3 p.m. in the food court. You'll also find a fashion show and live performances featuring the guzheng, a Chinese instrument, and a Peking opera. Dupont Circle FRESHFARM Market (20th Street NW between Q Street NW and Massachusetts Avenue NW, Washington, D.C.) is open Sunday, 9:30 a.m. from 1:30 p.m.
Takoma Park Farmers' Market (Laurel Avenue between Carroll Street NW and Eastern Avenue, Takoma Park) is open Sunday, 10 a.m. to 2 p.m.
Farm Women's Market (7155 Wisconsin Ave. NW, Bethesda): The Farm Women's Market has an indoor building and regular outdoor vendors. The market is open Friday and Saturday from 7:30 a.m. until 4 p.m.
Farmer's Markets in Alexandria: Three of Alexandria's farmers' markets stay open in the winter season. Old Town Farmers' Market (301 King St., Alexandria) is scheduled to run Saturday from 7 a.m. to noon. Del Ray Farmers' Market (corner of East Oxford & Mount Vernon avenues) is open Saturdays from 8 a.m. until noon. Four Mile Run Farmers' & Artisans Market is indoors during winter and is open Sundays from 9 a.m. to 1 p.m.
One Eight Distilling (1135 Okie St. NE): You can sample spirits, visit the tasting room and tour 7,500 square feet of spirit-making space every Saturday from 1 p.m. to 5 p.m. Tours are free. DC Brau(3178-B Bladensburg Road NE): The District's only combination brewery and beer packaging plant offers free tours on Saturdays at 2, 3 and 4 p.m. Make sure to wear closed-toe shoes!